Amateur makeup artist Gloria (Rodriguez) heads across the border for the weekend to help her friend Suzu (Cristina Rodlo) get ready for the annual Miss Baja pageant. At a party for the contestants the night before, the club comes under attack by a local drug lord named Lino (Cordova). The target of the attack was the corrupt chief of police, who was also the pageants producer. Caught in the crossfire, Suzu goes missing and Gloria is abducted by Lino. The young criminal takes a liking to Gloria and promises to aid her in finding her friend if she makes a delivery for them across the border. Without options or hope from the corrupt Mexican police she wades deeper into a world she doesn’t understand, but is helpless to avoid. Hardwicke who usually gets behind films of substance or at least zeitgeist feels more like a director for hire here than on any other project in her career. This recycled film opens with the undertones of Gustavo Santaolalla’s original score from “Babel,” another indication of this film’s in-authenticity. The character of Gloria is written as someone who lack’s common sense. In the first half of the film she makes the mistake of trusting the local Mexican police, believes the DEA will protect her, and eventually puts her faith in a drug lord. As in every film, there are no good guys in Tijuana. Within what feels like a 48 hour period, this meek woman finds a lifetime of courage and strength, not to mention learning how to use an AK-47 in ten minutes. Rodriguez’ continuously overacts whether she is portraying fear, confidence or sadness. Hardwicke who usually gets behind films of substance or at least zeitgeist feels more like a director for hire here than on any other project in her career. “Miss Bala” is a paint-by-numbers film that anyone could direct. This bland film-making doesn’t do the audience any favors between the narrative setups and lackluster action scenes that pale in comparison even to bad TV shows. It’s a cheaply made film that comes across that way in its lack of creativity. Avenger Anthony Mackie might be featured on the poster and with second billing, but his two scenes don’t even total ten minutes. Like with most American remakes of foreign films, the nuance of the original “Miss Bala” doesn’t translate well. 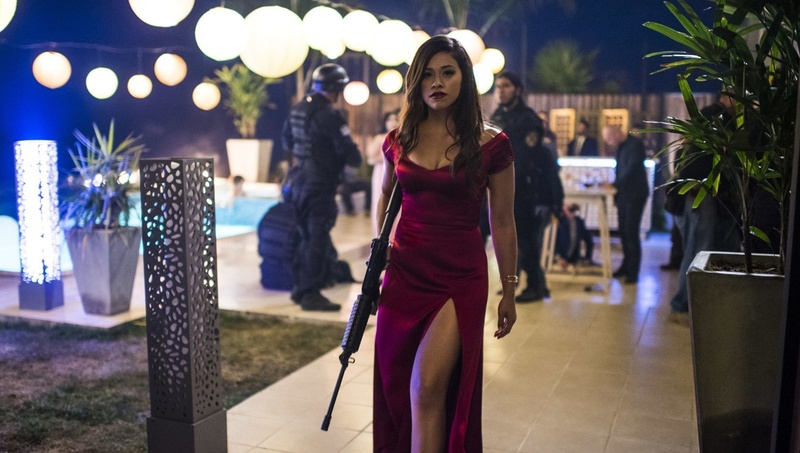 The American version of “Miss Bala” should be deported.